China is a tourist hotbed for so many people around the world. It has a stunningly diverse culture, culinary delights to die for, and the second most UNESCO Heritage Sites in the world at 36! Known for the Great Wall, pandas, terracotta warriors, and some of the most flavorful foods in the world, China is definitely guaranteed to entertain tourists for days, weeks, and maybe even months! To put it simply, China should definitely be on the top of your priority list when thinking about your next travel destination. It is a gigantic country with tons to explore, and you definitely have plenty of choices when deciding how to fly there. In this guide, we will do a deep dive into the best ways to fly to China with points and miles. There are so many airlines that operate nonstop flights from America; some of them have great premium cabin products and some…not so much. We’ll be focusing on nonstop flight options for the most part, and we’ll start with the frequent flyer programs that have the best award sweet spots! After that, we’ll move onto some alternative booking methods, depending on what points you have. Flying ANA business class using ANA miles will only cost 80,000 miles round-trip during low season! Visit Japan en route to China too! Image courtesy of ana.co.jp. ANA is, quite frankly, one of the most amazing frequent flyer programs in existence. They have jaw-droppingly good redemption rates, a generous stopover/open-jaw policy, and awesome coverage through the Star Alliance and other partners. ANA only allows round-trip redemptions and they are selective in passing on fuel surcharges from partner airlines. Although you can fly directly to various cities in China on partner airlines, it might be worthwhile to fly on ANA to China via Japan because the award redemption rates are typically much more competitive! Flying from North America to China on ANA-operated flights in business class will only cost 80,000-95,000 miles round-trip! Image courtesy of ana.co.jp. Using their stopover policy, you could also visit Japan before flying to China! Specifically, flying to China via Japan on ANA Business Class round-trip will only cost 80,000 miles — compared to directly to China on partners, which would cost 95,000 miles. The ANA partner award chart does not have adjustments for seasonality. This is the partner award chart for flights to/from Asia 1 (Zone 3), which includes China. Image courtesy of ana.co.jp. If you wanted to fly nonstop to China, your best options would be on United Airlines or Air China. We would generally recommend sticking with ANA due to its amazing business class product, though you may also choose to fly on Hawaiian Airlines if you’re located in Hawaii. 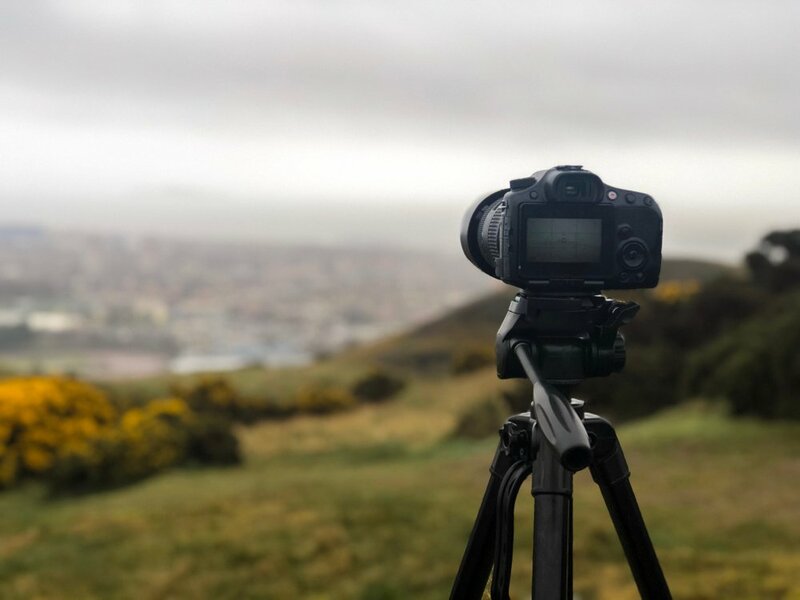 However, we know that time is money — so if you would accept spending up to 15,000 more miles for nonstop round-trip flights in a less-impressive business class, then you should consider that. When you compare the above 2 award charts, you’ll notice that partner awards are priced the same as ANA-operated high-season awards. This means that if you planned on flying to China during high season, it will cost the same number of miles on ANA versus partners. This may be worthwhile for those who want to fly nonstop to China! Fuel surcharges are variable depending on which airline you fly. For example, ANA levies about $420 in total taxes and fees on round-trip bookings, whereas ANA does not pass on surcharges from United Airlines. Hot Tip: For more information on these fees, check out our article — The Ultimate Guide to Airline Fuel Surcharges (Including Those That Charge The Most & The Least). However, if you decide to fly on the arguably inferior United Business class, you will only pay around $73 in taxes and fees round-trip. Nonstop United Airlines Route Options From the U.S. Nonstop Hawaiian Airlines Route Options From the U.S.
As you can see, there’s definitely no shortage of flights and carriers you can take to China from North America. Each of these flights (except the Honolulu service from Hawaiian Airlines) shares the same mileage cost of 60,000 ANA miles for round-trip economy, 95,000 ANA miles for round-trip business class, and 180,000 ANA miles for round-trip first class. The Honolulu – Beijing route serviced by Hawaiian Airlines costs 55,000 miles round-trip in economy and 85,000 miles round-trip in business class! Hot Tip: Booking with ANA allows 1 open-jaw and 1 stopover for round-trip awards. You can use this to plan value-added visits to Japan before proceeding to China! The Flight Awards section automatically appears on the left-hand side of the page you’re directed to. Click International then Award Reservation, and you will be prompted to log in with your ANA member number and password. Fill in the search query by typing in your cities, travel dates, class of service, and number of passengers. Click Search. Select the flights you want to take. If you need time to transfer your points, you are technically able to hold awards for up to 72 hours by calling ANA at 1-800-235-9262 during the hours 5AM-6PM PST, but this is highly variable depending on the representative you get. Finish transferring your points and confirm your reservation by paying any taxes and fees! ANA is a transfer partner with American Express Membership Rewards and Marriott. Your Amex points transfer at a 1:1 ratio in 2-3 business days, and Marriott transfers at a 3:1 ratio. Additionally, you will receive an additional 5,000-mile ANA bonus for every 60,000 Marriott points you transfer. This means that for transferring 60,000 Marriott points, you’ll receive 25,000 ANA miles! It usually takes up to 7 business days for Marriott points to transfer to ANA. Bottom Line: ANA is king when it comes to affordable round-trip award bookings. They have the best business class product (though no nonstop flights to China) and charge around $400 per person. You have the flexibility of enjoying nonstop flights on partners like Air China, and you’ve got solid transfer partners! We like using Alaska Airlines miles because they grant you access to some pretty awesome partners that no other frequent flyer program can provide! In fact, they might not be the “go-to” airline for flights to China, but they definitely provide a ton of value for one airline: Hainan Airlines. Hainan Airlines actually has an excellent reputation as an airline — they are a 5-star airline as characterized by Skytrax! We love using Alaska miles to book Hainan Airlines business class because they have an amazing portfolio of non-stop routes to China, and highly competitive award rates to boot. Alaska Airlines is an airline that is known not to pass on fuel surcharges, but Hainan Airlines is oddly not included in this; you’re going to pay around $400 in round-trip fuel surcharges flying on business class and $300 flying on economy. Round-trip economy class flights cost 60,000 Alaska miles + ~$300 in taxes and fees, while round-trip business class flights cost 100,000 Alaska miles + ~$400 in taxes and fees. One-way flights cost half the price. However, just like all Alaska award bookings, you can actually add a stopover on all one-way tickets, though these stopovers are typically confined to hub cities of partner airlines. Similarly, you can have 2 stopovers on round-trip tickets! 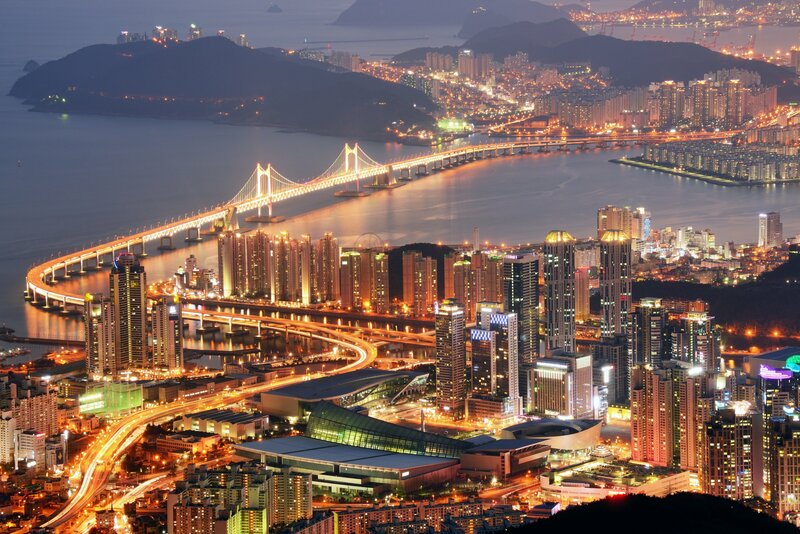 Los Angeles (LAX) – Chengdu (CTU) – Beijing (PEK) ; Shanghai (PVG) – Chongqing (CKG) – Los Angeles (LAX) in Hainan Airlines business class for 100,000 miles + ~$430 in taxes and fees! For this price, you can use 2 stopovers and 1 open-jaw to visit 3-4 cities for free! Hot Tip: Working in 2 stopovers on round-trip award tickets takes some patience; luckily, Hainan Airlines has a ridiculously diverse route map, so it’s very easy to visit 3+ places for the price of 1! Click the checkbox that says Use Miles to search for your routes and dates. Be sure to use Multi-city if you’re booking stopovers or open-jaws. Pick your desired flights and click Add to Cart. Log in to your Alaska Airlines Mileage Plan account. Complete the booking and pay any taxes and fees. You can earn Alaska miles very easily. First, you can get a bunch of Alaska miles through credit card sign-up bonuses — specifically, the co-branded Bank of America Alaska Airlines Visa credit card usually offers a sign-up bonus between 30,000-40,000 miles! Sadly, the only transfer partner Alaska Airlines has is Marriott, so you’re going to have to rack up Marriott points to transfer to Alaska. Finally, one of the best ways to accumulate Alaska miles is by buying them. You can buy as many miles as you want, with the limit set at 60,000 miles per transaction. But you can make as many transactions as you like! Also, Alaska Airlines routinely offers discounts of 30%-50% on purchased miles, so consider holding out until they have these sales. Bottom Line: Alaska Airlines provides the only way to fly on one of the best airlines to China: Hainan Airlines. With round-trip business class tickets costing 100,000 Alaska miles and the 2 stopover allowance, you should definitely consider using the diverse routes that Hainan Airlines operates. Be aware though, as you will be paying anywhere from $300-$450 in fuel surcharges. Alaska’s sole transfer partner is Marriott, so look at earning Alaska miles directly or buying them outright! Etihad is ordinarily an airline connecting the Middle East to the rest of the world. So, it doesn’t make much sense that it’s in this list…until you realize that it partners with American Airlines. And the redemption rates on AA metal are astonishing! AA devalued their award chart a while ago, but Etihad’s award chart for AA-operated flights has remained unscathed. Round-trip economy tickets for 70,000 Etihad Guest miles and round-trip business class tickets for 110,000 Etihad Guest miles. Total taxes and fees will run around ~$100. You can also technically fly on Hainan Airlines using Etihad Guest Miles, but it’s not a good use of your points. In fact, Etihad Guest will charge 106,000 miles one-way for the Los Angeles (LAX) – Chengdu (CTU) flight in Hainan Airlines business class, while Alaska Airlines charges 100,000 miles round-trip plus 2 stopovers. So, we know which airline is the clear winner for Hainan Airlines flights here! 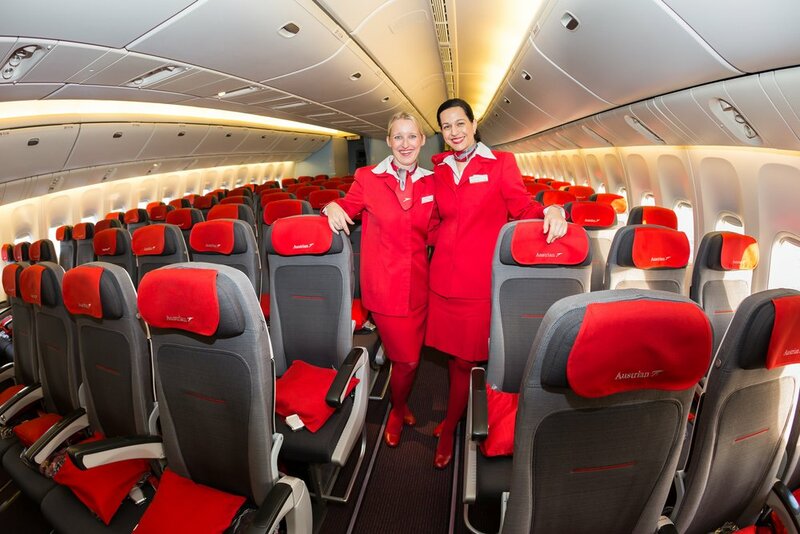 Business class seats feature direct aisle access and a 1-2-1 reverse herringbone layout. These are different, unfortunately, from the Flagship business class on the 777, but it’s a solid way to fly on a proven U.S. airline to China. American Airlines business class award availability is typically difficult to find, but those with patience will be able to reap the rewards with Etihad Guest! To book AA awards on Etihad, you’ll need to call after successfully finding award availability. Visit British Airways and log in to begin your availability search. Type in your route, travel dates, and business/economy class. British Airways’ search engine can be a bit quirky at times. It may not show availability, even if you’ve seen it on a site like Qantas or AA. You’ll need to play with the dates back and forth and keep refreshing if this happens. Write down the flight numbers, dates, and times. Call Etihad Guest’s Serbian Call Center at +1-877-690-0767, press 1 for English, and then press 4 (don’t press 2 for “first and business class” bookings!). After that, press 1 to book or change a flight, and then press 1 again to book or change a flight using Etihad Guest Miles. Ask them to search for AA business or economy award space on the date desired. Provide them with the flight number. Complete the booking by providing traveler information and paying for any applicable taxes and fees. Etihad Guest is a transfer partner with American Express Membership Rewards, Citi ThankYou Rewards, and Marriott Bonvoy. It is therefore easy to earn Etihad Guest miles! American Express and Citi transfer to Etihad Guest at a 1:1 ratio, and sometimes American Express runs transfer bonuses of up to 30% bonus miles. However, the only times this ever happened were in 2016, where there were 2 transfer bonuses of 30% and 20% during May and October, respectively. I wouldn’t really count on that to happen these days, though it’s a distant possibility. If you did catch a bonus, this would bring down the cost of round-trip AA business class ticket from 110,000 miles to ~84,615 Amex points! Definitely keep your eyes peeled. You can earn ThankYou Rewards points with any of the ThankYou Points-earning credit cards and transfer them to Etihad Guest at a 1:1 ratio. Citi ThankYou points may take up to 7 business days to transfer, while Amex’s transfers are instantaneous. Bottom Line: Interested in flying American Airlines’ business class to China round-trip for 110,000 miles plus minimal taxes and fees? Seriously consider Etihad Guest — they still use the pre-devaluation award chart! Economy costs 70,000 miles round-trip, plus Etihad Guest is a transfer partner with Amex, Citi, and Marriott, so you shouldn’t have any issues racking up enough miles! 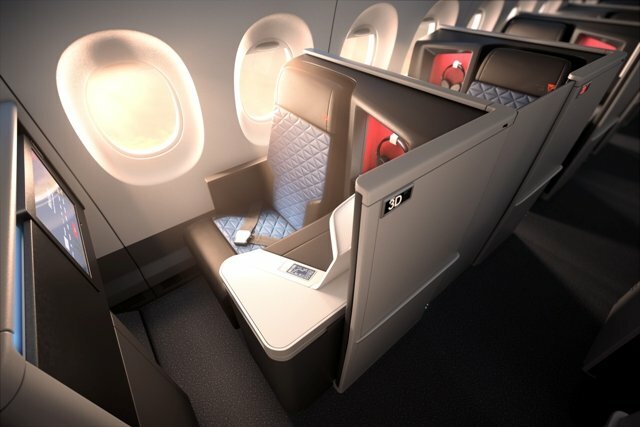 Try Delta One Suites on flights to China from Detroit or Los Angeles for 120,000 Virgin Atlantic miles round-trip! Image courtesy of news.delta.com. Virgin Atlantic is not in any major airline alliances, but it has several key advantages for travel to China. It partners with Delta Airlines and is also a transfer partner with all 4 major transferable currencies: Chase, American Express, Citi, and Marriott. On top of this, the Flying Club award chart for flights on Delta is excellent: round-trip economy costs 80,000 Virgin Atlantic miles, while round-trip business costs 120,000 Virgin Atlantic miles! The 2 other reasons this particular program is amazing are the frequent transfer bonuses of up to 35%, and the fact that fuel surcharges are never passed on! Delta One Suites is astonishing, and I would definitely do whatever I could to fly this over the regular business class product! For 120,000 miles round-trip and super-low taxes and fees (like $35 round-trip low), there’s a reason Virgin Atlantic is near the top of our list when it comes to flying to China with points and miles! Honestly, the main challenge is finding award availability — though this isn’t even that big of a deal, since Virgin Atlantic allows 5-week award searches! The icing on top is that Virgin Atlantic miles all transfer from flexible rewards currencies instantly, and you can book Delta awards completely online! Visit Virgin Atlantic. You’ll get the best results when using the United Kingdom version of the website. To change it, click the flag emblem at the top-right of the page and choose United Kingdom – English. At the top of the new page, you should be able to type in your flight information. Type in your route, flight type, number of passengers, and travel dates. Click Advanced Search toward the lower right of the banner, click Miles, and choose Upper Class to return business class availability. Click the red arrow to execute the search. If availability doesn’t show up, scroll down and select Show flights for Within 5 weeks. Click Find my flights. Complete your booking by paying the miles and paying for any taxes and fees. Earning Virgin Atlantic Flying Club miles is super easy — it is a transfer partner with Chase Ultimate Rewards, American Express Membership Rewards, Citi ThankYou Rewards, and Marriott Bonvoy! Each one of these transfer to Virgin Atlantic Flying Club at a 1:1 ratio, with the exception of Marriott at 3:1. For every 60,000 Marriott points transferred, you’ll get an additional 5,000 Flying Club miles, bringing up your total to 25,000 miles from 60,000 Marriott points. American Express and Citi often have transfer bonuses ranging from 25%-35%, so wait to transfer your points until these are offered! They do so at least once per year, but often 2-4 times per year! A transfer bonus of 30% will bring down your Delta One Suites round-trip cost to ~92,308 AmEx or Citi points + ~$35 in taxes and fees! Furthermore, Virgin Atlantic Flying Club miles can be earned directly from the co-branded credit cards issued by Bank of America! The last thing we want to reiterate is that all except Marriott transfer instantly to Virgin Atlantic Flying Club. Marriott is not far behind, and will take less than 24 hours to transfer to Virgin Atlantic. 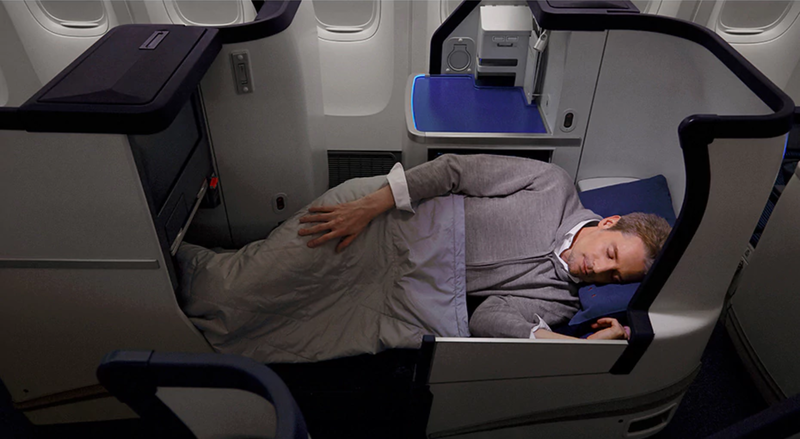 Bottom Line: Delta One Suites are often prohibitively expensive when booked on Delta. Virgin Atlantic provides an amazing solution to this, with round-trip Delta One Suites priced at 120,000 miles + $35 in taxes and fees! Lots of transfer partners, no fuel surcharges, and a completely online booking process make this redemption a no-brainer! Be sure to plan in advance (especially for Delta One Suites routes), because award availability can be hard to come by. Japan Airlines uses a distance-based award chart, so prices of awards may vary depending on the distance between the 2 cities you select. With the new devaluation coming on November 20, 2018, JAL award redemptions are going to be more expensive. For simplicity, we will assume that you’re flying round-trip to China from North America. As you can see, the range of distances across the routes operated by the 2 airlines above is pretty diverse. The shortest route is Honolulu (HNL) – Shanghai (PVG) by China Eastern at a round-trip distance of 9,864 miles, while the longest route is New York City (JFK) – Shanghai (PVG) by China Eastern at 14,720 miles round-trip. Overall, the range of prices in economy is 40,000-60,000 miles round-trip, business is 65,000-100,000 miles, and first is 105,000-155,000 miles depending on the route you take. Hot Tip: JAL will be heavily devalued starting on November 20, 2018. If you book before then for travel after that date, you’ll still be able to secure the pre-devaluation rates as shown above. However, once that deadline is passed, you’re going to see prices jump up! Interestingly, one-way prices are not equal to half the round-trip prices. If you’re planning on doing one-way travel and taking advantage of JAL’s industry-best routing rules (including stopovers and open-jaws), then you should calculate your miles cost based on the total distance traveled. Luckily, Japan Airlines has a great distance calculator for your use! You can book American Airlines flights directly on JAL’s website, though you have to call to book China Eastern Airlines. Visit Delta to search for award availability. We don’t like using Air France for this search, because their variable award pricing makes it difficult to distinguish whether a flight has actual availability. Type in your inbound and outbound cities, travel dates, and number of passengers. Click the Advanced search button right below the search area and select Miles and Delta One. After this search completes, modify it by clicking 5 Weeks on the Calendar View and Show Only Non Stop. This will effectively filter out all the connecting flights and give you true China Eastern availability. Scroll through the calendar and select available flights. Provide them the flight numbers, dates, and times. Finish your booking by paying for any taxes and fees and spending your JAL miles. The only realistic way to earn JAL miles is by transferring them from Marriott at a 3:1 ratio. For every 60,000 Marriott points you transfer to JAL, you will get an additional 5,000-mile bonus to bring your total up to 25,000 miles! It’s also possible to earn JAL miles directly with their co-branded credit card. However, it lacks a compelling welcome bonus and earnings categories that make spending valuable. Bottom Line: If you intend on utilizing JAL Mileage Bank to book your travel to China, you should definitely consider booking your travel before November 20, 2018. After that, you’ll be hit with a huge devaluation. For now, you won’t be paying fuel surcharges and you can leverage their generous award routing rules to build some sweet vacations! 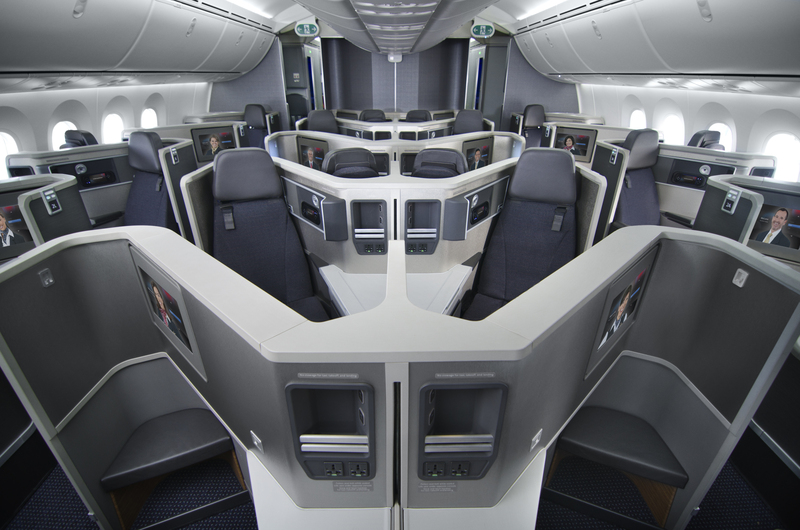 For 140,000 AA miles, fly on American Airlines 787 Dreamliner business class. 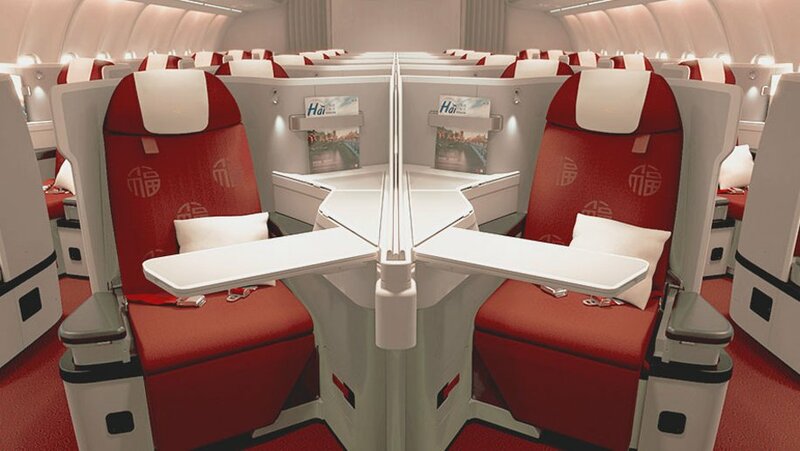 Enjoy luxe privacy and comfy seats on your way to China! Image courtesy of aa.com. American Airlines is generally a pretty attractive frequent flyer program for simple award bookings. AA miles are usually easy to accumulate, especially through credit card welcome bonuses from Citi and Barclays. The booking process is relatively simple, and award prices remain quite attractive to China. Your biggest challenge will be finding award availability, since you’re basically restricted to flying on American Airlines to China. Round-trip economy costs 70,000 miles from the contiguous U.S. to China, and round-trip business costs 140,000 miles. The other option you have is Hawaiian Airlines’ sole Honolulu – Beijing route, but it really only makes sense if you’re originating from Hawaii. Round-trip economy from Hawaii, oddly, is actually more expensive despite being geographically closer to China at 75,000 miles per person. Business class fares are the same at 140,000 miles per person. Importantly, you won’t be paying fuel surcharges on these routes, so your total out-of-pocket cost will be around ~$77 per person round-trip! You can refer to the chart above for the nonstop routes AA flies to China, but you’ll have to leave from Los Angeles (LAX) or Dallas Fort-Worth (DFW). Both of those 2 cities fly to Beijing (PEK) and Shanghai (PVG) on the same aircraft: the 787-900. Hot Tip: Need help booking? 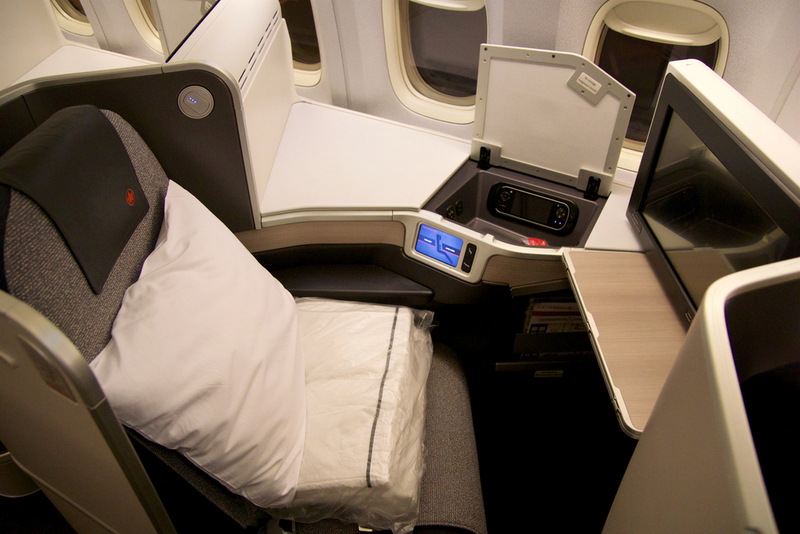 Check out our guide to book American Airlines Business Class using points. It’s generally very easy to get a lot of AA miles, particularly in the short term. Citi and Barclays both offer huge welcome bonuses on their co-branded AA credit cards. I would first apply for the Barclays Aviator Red Card and the equivalent business credit card, since Barclays is known to be more sensitive to hard inquiries than Citi. After you’ve exhausted your Barclays options, Citi is a great option! Additionally, American Airlines is a transfer partner with Marriott, so you can top off your AA miles balance with Marriott points by transferring them at a 3:1 ratio — but we definitely don’t suggest doing this unless you have a specific redemption in mind. It can take up to 2 business days to transfer Marriott points to American Airlines. Bottom Line: The main benefits of using AA miles to fly to China are attractive redemption rates, ease of earning miles from co-branded credit card welcome bonuses, and a very simple booking process. The drawback is that you’ll need to find award availability on AA business class, which can be tough. Use 160,000 United miles to book Air Canada business class to China! Image courtesy of shutterstock.com. With United Airlines MileagePlus, you will be eligible to use the same partners as in the above ANA section. The main benefit of using United Airlines MileagePlus is the convenience and ease of earning United miles. ANA offers very attractive rates, beating out United by a significant margin (50% or more). However, American Express Membership Rewards points will be the key factor in choosing to use the ANA method above. If you’re a big Chase fan, you might find United Airlines MileagePlus the go-to option for yourself. Economy costs 70,000 miles round-trip, and business costs 160,000 miles round-trip. First class costs 240,000 miles (the only first class flights would be on Air China). Surcharges are not passed on, with out of pocket costs ranging from $6-$80 total! You may also choose to book on Hawaiian Airlines round-trip between Honolulu (HNL) and Beijing (PEK) for 55,000 miles in economy and 120,000 miles in business. Although you won’t be responsible for fuel surcharges, you’re generally compensating for it by paying more miles to book your trips. For example, round-trip business class on Air China only costs 95,000 ANA, miles while United charges 160,000 miles. The best part of United Airlines MileagePlus is the ability to easily earn United miles. When thinking about the best ways to earn United Airlines miles, your best friend is definitely Chase! You can earn lots of Chase Ultimate Rewards points and transfer them to United, or earn United miles directly from co-branded credit cards offered by Chase. The last option is to transfer from Marriott at a slightly improved 3:1.1 ratio. In addition to this, you will also receive a bonus for transferring 60,000 Marriott points to United. Overall, transferring 60,000 Marriott points will net you 27,500 United miles! 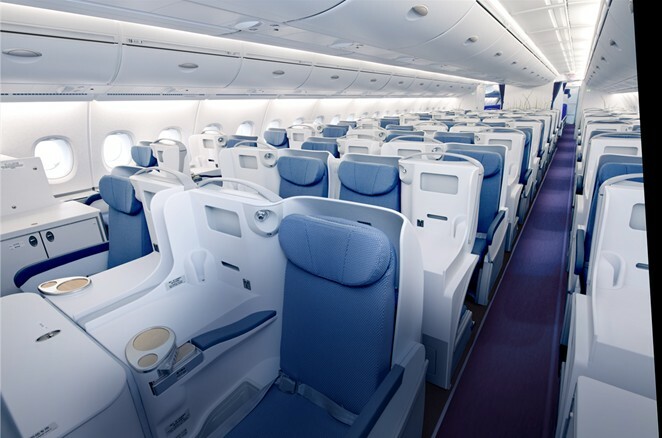 If you’re flying on a China Southern A380, you’re in for a treat with 1-2-1 business class seating, direct aisle access, and quality Chinese food! Image courtesy of csair.com. Honestly, we would be doing you a disservice if we discussed the best ways to fly to mainland China with points and miles and didn’t mention the SkyTeam alliance. In fact, Delta actually has the most partners that fly to China. As discussed in the Virgin Atlantic section, they also operate their own flights to China, including 3 of them with Delta One Suites! Interestingly, fuel surcharges are not consistent among these 5 airlines. China Eastern charges the most — anywhere from $450-$545 depending on which cabin class you’re flying. Delta will pass on around $280 in fuel surcharges for China Southern. Hawaiian Airlines, Delta, and Xiamen will not have fuel surcharges, bringing down the ultimate out-of-pocket cost to approximately $35 total. Hot Tip: Be sure to use the Delta flexible 5-week award calendar search tool to check for award availability! You’ll notice we don’t talk about booking Delta One with Delta SkyMiles, because their prices are so ridiculous it’s not even funny. They charge anywhere from 180,000 to 600,000 SkyMiles on round-trip flights…not exactly the best use of your points! There are plenty of ways to earn lots of Delta SkyMiles. A great way to get a head start is by looking at their transfer partners: American Express Membership Rewards and Marriott. You can also earn Delta SkyMiles directly from the Delta co-branded credit cards offered by American Express. Bottom Line: If you want to try any SkyTeam airlines then Delta is a great way to do so, particularly on partner airlines in business class! Delta is excellent for round-trip economy flights on their own metal, but not-so-excellent on business class flights on their own metal…stick to Virgin Atlantic for those. Searching for availability is super easy, and you have lots of airline choices when booking through Delta. There are a lot of other ways to fly to China with points and miles, including Cathay Pacific Asia Miles, Air France/KLM Flying Blue, Qantas Frequent Flyer Miles, Malaysia Airlines Enrich, Asiana Airlines Mileage Club, Singapore Airlines KrisFlyer, Korean Air SKYPASS, Avianca LifeMiles, British Airways Avios, etc. For the most part, we focused on nonstop flights to China from North America. However, we also recognized that adding a stopover in Japan by flying on ANA metal can actually save you miles, especially when flying during low-season. Plus, they arguably have the best business class product of any airline in this guide. There are tons of airlines that fly directly to various cities in China from many cities in America. ANA has excellent round-trip redemption rates, as does Alaska Airlines on Hainan Airlines flights and Etihad Guest on American Airlines flights. Virgin Atlantic has a sweet spot, particularly when flying Delta-operated flights on their amazing Delta One Suites. Overall, there are numerous ways to fly to China with points and miles, and we’ve definitely covered our bases here. You should certainly be ready to get the best deals on award flights now! Which airlines include carrier-imposed surcharges on award flights to China? ANA only levies fuel surcharges on their own metal. Total fees and taxes are about $420 round-trip in business class. Alaska levies fuel surcharges on Hainan Airlines, with a total of around $430 round-trip in business class. Delta passes on fuel surcharges from China Eastern (around $500 in round-trip business/first class) and China Southern (up to $280 in first class). What is the fewest number of miles you can use to book an economy class award flight to China? Delta is absolutely the best choice here. They’ve got round-trip economy flights between S,eattle and Shanghai for 40,000 SkyMiles. Seattle to Beijing will be around 44,000 SkyMiles, and Los Angeles to Shanghai will be around 60,000 SkyMiles. Best of all, you won’t be hit with fuel surcharges! What is the fewest number of miles required to fly business class to China? With 80,000 ANA miles, you can fly during low-season to China via Tokyo on a connecting flight. Since ANA allows stopovers, you can visit 2 places for the price of 1 with a stopover in Japan! The cheapest direct flight in business class would be using 95,000 ANA miles to fly on Star Alliance partners such as Air China, United, or Air Canada. 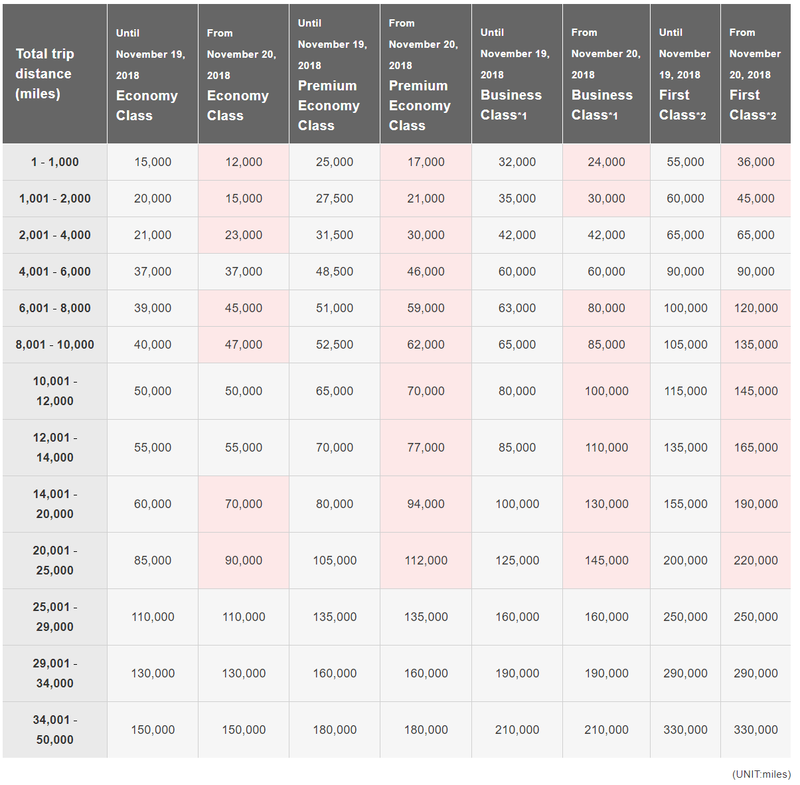 If you act fast, you can use 80,000 JAL miles to book some of the routes in the section above in business class! You may also choose to fly on Hainan Airlines for 100,000 Alaska Airlines miles round-trip. Lastly, if you want to fly in Delta One Suites, it will cost 120,000 Virgin Atlantic Flying Club miles for a round-trip flight. You won’t pay fuel surcharges for this either! What is the fewest number miles required to fly first class to China? To fly first class to China would cost quite a bit of points. 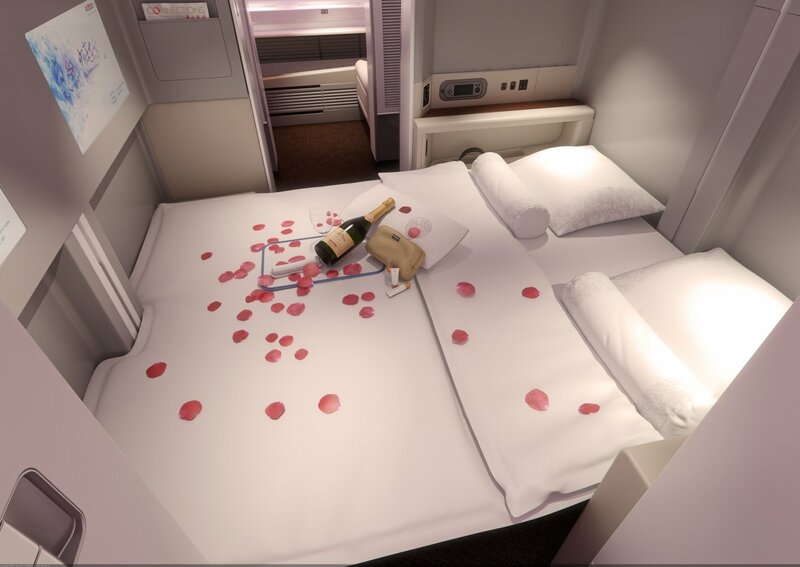 Your best bet might be to use 180,000 ANA miles to book Air China First Class. Another alternative we didn’t discuss is to use 160,000 Asiana Airlines miles. We didn’t talk about it much because of the difficulty in earning lots of Asiana Airlines miles with a single transfer partner (Marriott). Really amazing article you got going on here. Thanks Haley – we’re so glad you’re enjoying it!